While I was in New York, as usually my super-domestic friend JH inspired me to cook more at home. I mean, as you saw in my photos from the trip, she cooks from scratch at home daily. Since she sent me home with a bunch of the wild blueberries we'd picked, I decided I ought to make some blueberry muffins when I got home. 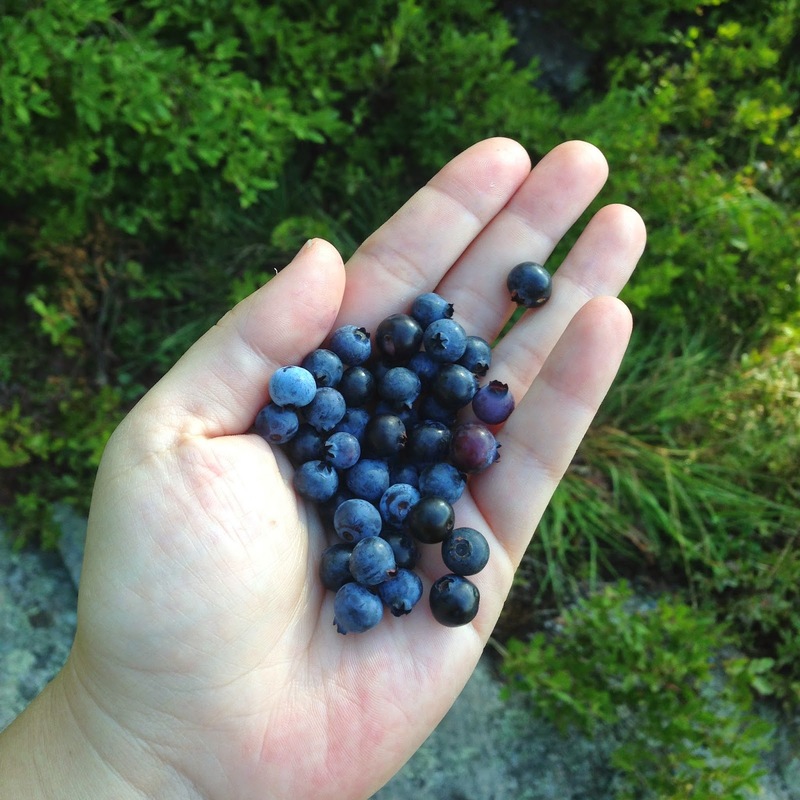 Wild Blueberries > Store-Bought... just saying, look! I used a recipe I found online, "To Die For Blueberry Muffins" from Colleen via AllRecipes. I used a standard size muffin tin, and it yielded 9 muffins. Dan and my coworkers RAVED about these muffins. One work friend told me it was the best muffin she'd ever had. I think it was a combination of the awesome wild berries plus the crumb topping. I'd never made muffins with crumble before, but these were super easy and very good! Also inspired by my NY visit, I realized that we could save so much money on buying snacks and pre-mixed granola (and have more control over the ingredients) by making our own at home. This was a huge hit with Dan, who's been taking baggies with him to the brewery to munch on throughout the day. I store these in an empty mason jar I had lying around. For this granola, I used a recipe from All You magazine for "Coconut-Cranberry Granola" but omitted the coconut. It's very good, and Dan says he'd like to add dried blueberries next time. The can of oats I bought can basically yield two batches of this, which I think is great. Overall we get more bang for our buck vs. buying granola or even cereal in stores. You can add milk to this and eat it as cereal for breakfast! I know this isn't the sexiest blog post ever, but these pics got some good engagement on Instagram and Facebook, and overall I'm proud to be embracing my inner domestic diva of late. Hope you check out these recipes and get inspired to cook some goodies for your family! Have you baked anything good lately?